PS: Well I suppose we should just start right off with Parlour Flames. I know you’ve actually worked with Vinny Peculiar before, correct? Bonehead: Yeah, I have, yeah. Probably 7 years ago, maybe more actually. I’ve stood in on bass guitar—it’s not really my instrument, but his bass player at the time couldn’t make the tour in Europe and he asked me to stand in. So I had no time to rehearse, I just jumped on a plane and did it and Mike Joyce from the Smiths was on drums. It was a great tour, we had a really good time. So that was how I got involved really, through Vinny being a friend of Mike Joyce’s. PS: Yeah, because a while ago you had plans to be in a band with Mike and Andy Rourke [Smiths bassist], correct? Moondog One? Bonehead: Yeah, that’s right. That was more of a studio project really. I recorded a few tracks down at my studio. It was good, you know, but Andy sort of went off to do other things. And then I think a couple months after that, I think that’s when Mike originally got the call from Vinny about needing a bass player and drummer and asked if we could go on tour. Because Mike was part of Vinny’s band for a while, along with Craig Gannon, who was also in the Smiths. But yeah, it was interesting. PS: So then coming together to work on this album, was the idea just to sit down and try writing songs together or did you have ideas separately? Bonehead: Well initially, I think, after the tour of Europe I did with Vinny where I played bass, I really got to know him and I got to know his songs. Lyrically, the songs are always—I’ve always really liked Vinny’s lyrics. And we just got talking and we just said, “If ever we get a spare moment, it’d be good to get in the studio together and collaborate on just a handful of songs.” The plan was to sort of get together and see if we could write together and work as a partnership and maybe just self-release an E.P. You know, three songs, see how it runs. Eventually, 7 years later we got together to do this, and we found that two songs turned into three. Before we knew it, we have five songs, and before we knew it, we had an album. And Cherry Red picked up on the album and said they’d release it, so it all stemmed from that, really. PS: OK. So what’s the division of labor like when it comes to songwriting? I know, obviously, Vinny’s always been a words man. Are you contributing the music or are you both doing the music? Bonehead: We’re both doing the music. All the lyrics are contributed by Vinny himself. When we first walked into the studio, obviously, we’d never worked together. I had sort of finished songs minus the lyrics. I had the whole layout of four or five tracks that just needed lyrics, which Vinny took away and worked on at home. And Vinny also had a couple of songs—again, about four or five songs—that were complete finished songs that we got together and worked on middle 8’s and whatnot. Some songs are sort of really rewritten from scratch. We had a bunch of ideas together that we just sort of jammed up in the studio. So, you know, it’s a bit of both really. From templates and also from scratch. PS: Was there any direct musical template to draw from for this? Or was it what strikes you? The reason I ask is if I listen to something like “Sunday Afternoon” or “Lonely Girls & Horses,” immediately I’m thinking Burt Bacharach. 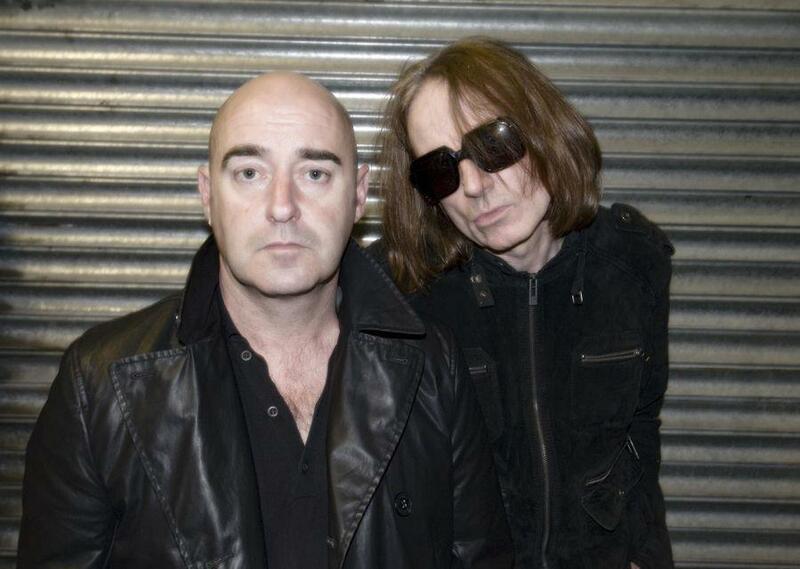 Bonehead: Yeah, well you see, we’ve both got very similar tastes in music. We’ve both introduced each other to music that we’ve never heard before. But we didn’t have a plan when we went in. When we sat down, first and foremost, we didn’t know whether the partnership would work as a songwriting partnership. I mean I had no definite idea how it was gonna sound. We didn’t go in and say, “OK, we’re gonna do this song and we’re gonna aim for it to sound like David Bowie, 1974-era” or whatever. I think it was just a combination of things. My style of play, which is very different to Vinny’s. And both these styles come together. I think once we got three songs in in the studio, we were very obviously developing a sound which became the Parlour Flames sound without consciously saying, “This song’s gonna sound like that.” “Sunday Afternoon,” for example, you know, I think listening to it musically, it could be a French pop song. But we didn’t go in with that idea. We didn’t even initially even dream of putting horns on it. It was only when the song was nearly finished that I think I turned around and said, “You know, this would sound great with some flutes and brass section on it.” So it wasn’t a conscious effort. It just evolved as we went along. PS: Was that an easy enough task to put horns on it, woodwinds? Because it is very nicely ornamented throughout the whole album. Bonehead: Well, we’re fortunate that we know some great players. We did try to play as much instrumentally as we could on the album. All the bass guitars have been done by us, the keyboards, organs, xylophones. But obvious instruments like cello, flutes, horns and drums we didn’t do, but we did all the rest. But no, it was a really good thing to do. Like I say, we’re fortunate to know some really good players, so we just make the phone call and ask them to come in. Generally for brass parts, I’ll demo them on a keyboard and work out a part. Once we get that done, we call the brass player and he’d come down, listen to my parts and play them. It was quite straightforward and easy to do that way. PS: That leads me around to something I’ve always wanted to ask you because I’ve never known the full story. But growing up, how did you come into music? I know you play a bit of keys, was that the first thing? Did you learn guitar right away? Bonehead: No. I think the very first thing—I was probably about 10 years of age, I think. My parents sent me to lessons on piano/accordion. My parents were Irish—they’ve since passed away—but with the Irish background, they sent me to piano/accordion lessons. So, I learnt on that when I was 10, which led me to just tinkling on piano whenever a piano was around and stuff like that. But my older brother played guitar. He was self-taught and I shared a room with him. So there was always an acoustic guitar hanging around. I just picked it up myself. Taught myself chords and did a little bit of playing along to his record collection. Bonehead: Well, no, I mean it was always a game plan. But as to whether you’d succeed or not and have it become a reality, that was another matter. But it was always something I wanted to do and dream that I could do. Aside from that, I came from a real middle-class background in Manchester. I had quite a good education, but everyone just seemed to go off and do manual work—building work, which is what I did, you know. And that was the norm then, but it was still everybody’s dream to get out of the yard and be a footballer or be a musician in the area where I grew up. Fortunately, I got the dream job, you know. PS: It’s interesting too, because I know from all the books and stories I’ve read, you’ve been at some of those legendary gigs. I mean obviously you took part at Knebworth, but you were also at Spike Island. Bonehead: Yes. I was, yes. PS: So what was that like? Bonehead: Oh, it was amazing. It was really good. We went the night before and camped out, a whole bunch of us. And it was just a real event, you know? Everybody was buzzing for months before it, waiting for this event to happen. But I mean, I used to follow the Stone Roses around Manchester when they played regularly in the early years—even in 1984, going down to see the Roses in venues that were quite local to me. There was a venue called the International that was actually owned by the then manager of the Stone Roses, so he’d put them on quite regularly at that venue. So I’d always be there down the front. That was quite a small club, you know I can’t remember how many people—600 or 800—it held. So to get to see them at Spike Island with thousands of people that came from everywhere, it was quite an event. Amazing weekend. PS: What was it like when it dawned on you as Oasis were out in Wales recording Definitely Maybe and they’re just up the road doing Second Coming? Bonehead: I don’t know if I’d say we were in awe, but I mean that was a band that we looked up to—and that I still do. Musically, as players and as people, I still look up to them, absolutely. Even though I’ve since got to know them. Yeah, it was a little bit—you know, we were just like these kids off the street that had been thrown into recording a debut album. We were sort of aware that our idols were less than a mile down the road doing their second album, which was pretty cool. And Mani actually came down to visit. We went down to their studio one day—I think it was only Mani around at the time. I’m not sure the rest of the band were in, but it was quite a feeling, yeah. PS: It seems like Mani always was the closest to you guys. Bonehead: Yeah, he’s always been that way. I think he’s that character in the band, you know? Very outgoing. Mani’s here, there and everywhere and knows everybody. John [Squire]’s a bit more reserved. Ian [Brown]’s a nice guy. You know, they’re always a really nice bunch of guys. PS: Now the fact that you had piano lessons from an early age and could play a bit of keys. How important was that in the Oasis dynamic? Because I know in some of the early acoustic performances, you might be doing a bit of electric piano. Even later on as you got into the studio, I don’t know how proficient any of the other guys in Oasis were on keys, but how important was it for you to have that expertise? 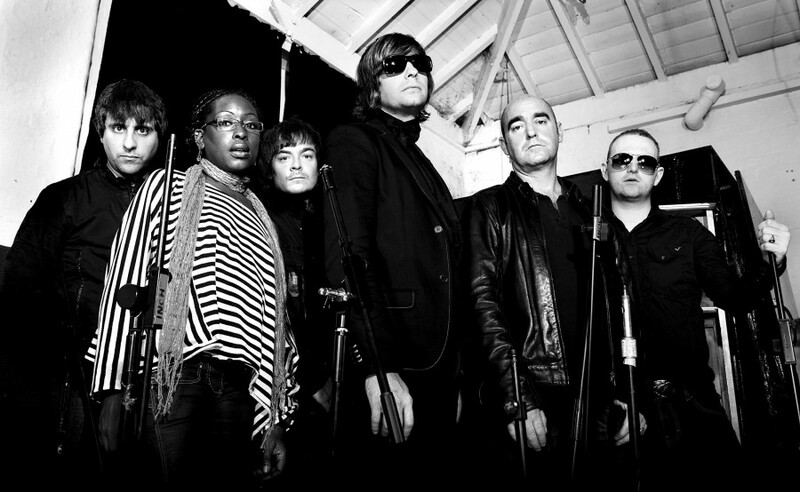 Bonehead: Well, very important, really, because when we did the debut album, we had a very small budget. We couldn’t afford to get big session players and whatnot. Fortunately I could play piano—I wouldn’t say brilliantly—but I could play it, so a lot of the early sessions that we recorded, I played all the keyboards on them. Hammond organs, mellotrons—you know, the mellotron on “Wonderwall.” Piano on “Don’t Look Back in Anger.” I did that. It’s not the best playing in the world, but it’s from the heart, you know. So it was pretty important that I could do that and it was great that I could do that, I really enjoyed doing it. But obviously as we got to the second and third album, we could afford to get players in. And we did a bring a touring keyboard player in—Mike Rowe, who was great and taught me a lot as well. PS: Now before Oasis came together and even before [pre-Oasis band] the Rain came together, you and Paul McGuigan had hung out as friends, right? Bonehead: Yeah, we came from the same area in Manchester and hung out with the same group of people. So I got to know Guigs before I’d met any of the rest of the band. We hung out in bars together and just generally hung out in the same crowd. PS: Was the plan after that bust-up on the first American tour between Liam and Noel that you and Guigs could go home and get back into building work? Bonehead: Yeah, yeah. [Laughter] We really did think that was going to happen. As the days dragged on, it really didn’t look as if Noel was coming back. So it was quite a nervous moment and we seriously did think that was it. I think all the band thought that it was over before it even really took off. It wasn’t a nice moment. PS: Did that just kind of become expected behavior as the band went on? Bonehead: It was never quite as bad as that, I think. But there was always bust-ups and fallouts and whatnot. But you know, that’s just two brothers in a band, you’re gonna get fallouts. In any band, really, that’s it. I don’t think it was as bad as sometimes the press made out. PS: Right, right. Well everyone needs sensationalism to sell papers, don’t they? Bonehead: Well, Oasis were really good tabloid fodder, you know? Liam does something, walks off or has a little difficulty with his brother and it’s front-page news, headline news on the TV at some points. Which really did get a bit out of control, and was weird. But that was Oasis at that time, you know. Bonehead: That’s alright, no worries. PS: Talk to me a little bit about—I know you spent some time, I don’t know if you recorded with them, but I know played live with the Vortex. Bonehead: Yes, I recorded with them. We did some demos and stuff, but I played with them live for a year, or maybe more than a year, I think. I had a really great time and I really did enjoy being in that band. It was almost like being in Primal Scream for a while. Really enjoyable, really good fun. It was sort of the first thing that I’d taken really seriously since leaving Oasis. I had a great time with it, and it’s a shame that it all sort of fizzled out, but you know, they’ve gone on to do other stuff and they’re doing alright. Great bunch of people. PS: Is it a conscious decision—as you said that was the first thing you took seriously after Oasis—to move back into music. I know you did DJ sets, but is it something where you have to weigh that going forward, whatever you do, it’s gonna be “Bonehead, ex-Oasis”? Bonehead: It’s always gonna be that. It’s always gonna be that. But I think with the Vortex, it was the first time that I’d come off stage with them and I had a similar feeling to the same one I had in 1994 with Oasis. Onstage with a bunch of people who were really quite passionate about it, but at the same time, really having fun and making a great band. It really gave me that feeling and that buzz again. They had that energy about them, which is what I really liked and why I decided that I’d love to be on stage with these guys. PS: It’s interesting that you talk about that passion, because I’ve always wondered this about established musicians—especially after they’ve spent their time in the band that’s going to define them for the rest of their lives. You might be in a position where you’ve got a notable friend, “Oh, Mike Joyce wants to do something,” you know, go on at a charity gig, do something together, and that’s that. Going forward, whether it’s Parlour Flames or whatever music project you get involved in, how important is it to you that there is that passion? What do you need to say, “Yes, I want to do this”? Bonehead: Well that’s just it. I think you have to have that passion. You’ve generally got to have it. I think if somebody’s been in this business for over a certain length of time, if you’re still playing guitar and getting on stage 20 years later, then I think you’ve got that level of passion. You really have. You’re not just doing it for the sake of it. It’s really important to have that, because I think that if you haven’t got it or belief, you’re really not gonna succeed with it. I think it’s inbuilt in every great musician. PS: Now in the days after you’d decided you didn’t want to be in Oasis anymore [ed. note: Bonehead quit the group in 1999, during sessions for the Standing on the Shoulder of Giants LP, Guigs left shortly therafter], what were you making of the rumors of your possible replacement? Bonehead: Well there were rumors after I’d put my official statement saying that I was leaving the band. Of course, the rumor mill went into overdrive, and there were all sorts of rumors—everyone’s second guessing, “Who’s gonna replace Bonehead?” One of the names that kept coming up was Johnny Marr. It kept coming up and it was all over the press that Johnny Marr was gonna take my place. He very nearly did, I think. Or maybe not. I don’t know. But he actually rung me at home one day. “Hi Bonehead, it’s Johnny.” I said, “Alright?” He just said, “Look, I just want to tell you, I’m not joining Oasis.” You know, I wasn’t panicking. [Laughter] He just sort of phoned me up to say, “Ignore the rumors, it’s not gonna be me.” Thank God, really, you know, for me. [Laughter] ‘Cos he’s pretty good, isn’t he? PS: Well it’s a cool move to make. I would assume he’s under no obligation to tell you one way or another. Bonehead: Oh, absolutely not. And again, it’s sort of none of my business who was gonna replace me. But it was a really nice gesture for Johnny to ring me and say, “Look, ignore the rumors. I’m really not joining Oasis.” That was cool of him. PS: As it turns out, you’re actually cool with both Gem and Andy Bell, correct? Bonehead: Oh, I love ‘em to bits. They’re really, really nice people. I saw them a couple months ago in Manchester with Beady Eye. They took me backstage before they went on. And they’re really nice people, and I was genuinely, genuinely happy for them. Because [after leaving Oasis] I was second guessing it at one point. I’m like, “Who will they get in?” I didn’t know. When it was announced it was Andy and Gem, I was more than pleased. You know, you couldn’t get two better players, but more importantly, two better people in my view. PS: Had you known them from the Creation days? Bonehead: Yeah, yeah. I knew Andy and I’d met Gem through Heavy Stereo. We’d been to see them in the past. I didn’t know them personally. I’d met Andy a lot of times, but I’ve since got to know Gem. I’ve met him a few times and I flew over to Barcelona to see the Stone Roses last year—the first European gig in Barcelona. I flew over with Gem, Andy and Liam and spent the weekend with them. It was brilliant. They’re great people. PS: How’d it compare to Spike Island? 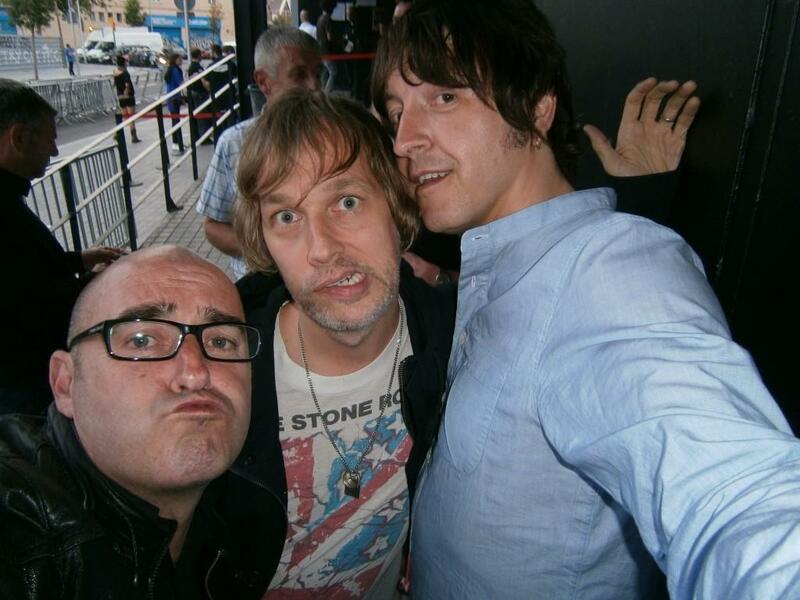 Bonehead: Erm, you know, I was probably more excited for the Barcelona gig, to be honest. Bonehead: Yeah, I think so. Because they’d gone and when they disbanded, I was really gutted that they’d split up. I always hoped that they’d go on to release five or six albums. So when they split up, it was a real shame. And then, of course, years later there was the whole “will they, won’t they” about getting back together. And when they did, I just was so looking forward to seeing them. And getting over with Liam, Gem and Andy was just a special moment, really. To see them all again. It was amazing. Well worth it. PS: So when you guys hang out now, is it just like old buddies from school getting together? Bonehead: It is. We sort of sit up all night in the bar, drinking beer and chatting after the gig. Still, you know, for Liam—even taking pictures with Ian and Mani was pretty special for him. I mean, John Squire came on stage and joined us for a song at Knebworth. 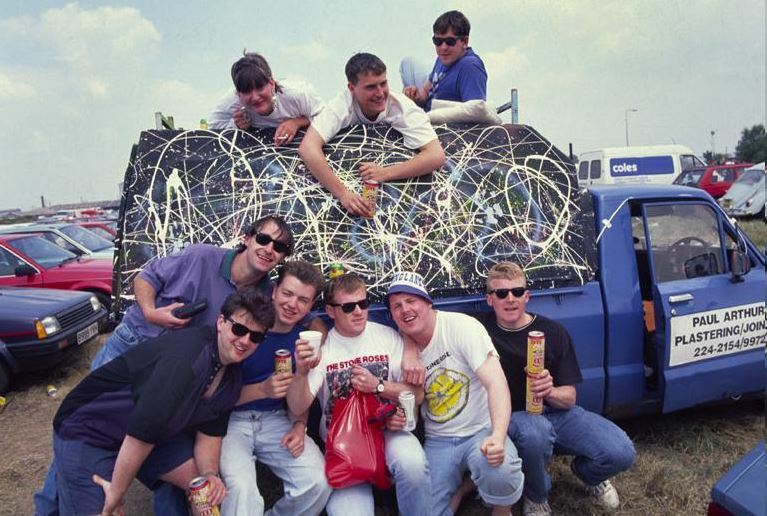 The whole lot of us were so—even though we knew him and it was John Squire our friend—it was still a special moment. I looked to my left and it was, “OH MY GOD. I’m on stage with John Squire,” you know? Friendships aside, there’s still that secret fan inside. PS: Were there any other moments during the Oasis years that blew you away in terms of meeting people or sharing the stage or studio with anyone? PS: Now I have to ask you this too. A couple years ago I got to see Fran Healy and Andy Dunlop of Travis do an acoustic gig in the States a couple years ago. They kind of did it in the “Storytellers” format. Bonehead: I saw that. I saw that. I saw the YouTube footage of it. It was great. Bonehead: I’ll just say that I’m a professional weeper. [Laughter] I can cry at the drop of a hat. No, it was great. I’m a big fan of Fran and Travis and their music. I remember them coming out and supporting us in the early days, taking them on tours. Again, really nice people. We’re really great friends. I’ve not heard the new album yet, I’ve got to do that. Apparently they’ve done a couple of festivals here in the UK and apparently it’s just been amazing on stage. But I think they might be back in November, maybe? Touring the UK. I’ll go and catch ‘em there. PS: Yeah I was gonna ask if you’d crossed paths at festivals this summer. Bonehead: We’ve done a lot of festivals this year, but none that Travis have been on. We’ve done Glastonbury, Isle of Wight, but unfortunately Travis aren’t on any of them. It’d be nice to see them, but they’re doing a club tour in the UK in November, so I’ll get out there and catch it on one of those dates. PS: So what else is coming down the pipe for Parlour Flames? Bonehead: Well we’ve got a bunch of songs ready to record again. We’ve got a few gigs yet to finish up for the summer. Isle of Wight Festival, which should be good. All manner of people are playing—Flaming Lips are playing, which will be great. Snoop Dogg’s playing, which I’m actually pretty excited for. That’ll be good. So we’re doing that, and then we’ve got a handful of gigs again in September and October. In between, the plan is to get back down in the studio and get these ideas that we’ve got on tape as it were. Start recording songs for a second album. PS: OK. So this is something you’re set to be in for a while? Bonehead: Yeah. We’ll at least record another album. We’ve got some great songs ready to go. You know, it’s a day at a time with some of these projects. That’s how it goes. Bonehead: Yeah! And people have listened to that and there are a few songs like that on the album. I don’t think people knew what to expect, really. Well if it’s Bonehead involved, there’s gonna be huge power chords. Which there are a few, but I think I have matured as a person and a player. I’m still more than capable of doing the big Bonehead power chords, but I’ve matured as a player and I think that comes across in songs like “Pop Music, Football & Girls” and “Sunday Afternoon.” They’re a bit lighter and they sort of reflect where I am at the moment. I suppose you grow up, I’m looking at 48 years of age. The days of standing on the edge of the stage, staring people out, playing huge, big rock chords are sort of behind me now. You move on, don’t you? You turn a corner, which I think I’ve done. PS: Yeah. Is it still a natural thing for you to just pick up the guitar and tinker with it at home? Bonehead: Oh, absolutely. There’s a guitar in every room, you know. A guitar is never far away. So every day you pick one up and have a tinker about, yeah. PS: Well I gotta ask you this too. As a United fan, what was it like to be in the band that arguably made Manchester City more world famous than the club itself probably could do in the 1990s? 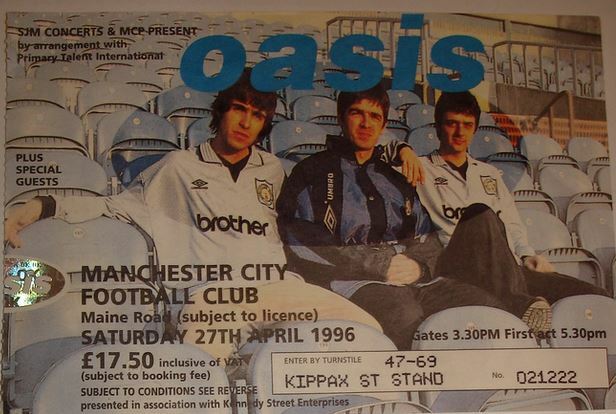 PS: Well you actually grew up close to Maine Road, didn’t you? Bonehead: Yeah, very close, yeah. Maybe two and a half or three miles, if that. And I used to go to a lot of games there, even though I supported United. If City were playing at home, there were big gangs of us that would go down and watch them. It wasn’t all United, you know. PS: Right. But you still didn’t want to be on the ticket stub for the Maine Road gig, huh? PS: Still wanted to try to at least be able to get in to Old Trafford every now and again? PS: Well I saw the little video you did for “Pop Music, Football & Girls” down at the Aston Villa ground. So now you have to be worried about being tagged as a Aston Villa supporter? Bonehead: No, no. I mean, Vinny’s a lifelong Aston Villa fan. He absolutely lives for them, so his plan was to get in touch—he knows people involved with the club. And it was great, we had a really great day down there doing that video. But we’re actually hoping to get down there in December as guests when Villa play United. I think they might get us some seats, and we can get down there, which should be interesting. PS: Good dialogue between you and Vinny during that, I’m sure. PS: Well at the moment that’s just about everything I was looking for. I want to say thank you again for giving me the time, and if I can, I just want to put in my vote for if there ever is an Oasis Anthology in the style of what the Beatles did, I want some of those outtakes of “Bonehead’s Bank Holiday” with you and Liam trying the lead vocal. Brilliant Interview, really enjoyed it. Thanks both.